Prior to Sunday night’s episode of Game of Thrones there had been two times when watching an episode of the show I said to myself “I can’t believe this is a television show.” First there was “Blackwater” in season two and then last season’s frigid zombie death match, “Hardhomme.” Now it’s been three times I’ve said that, with “Battle of the Bastards” as the latest example of Game of Thrones showing an unmatched ability to make the small screen feel much bigger. 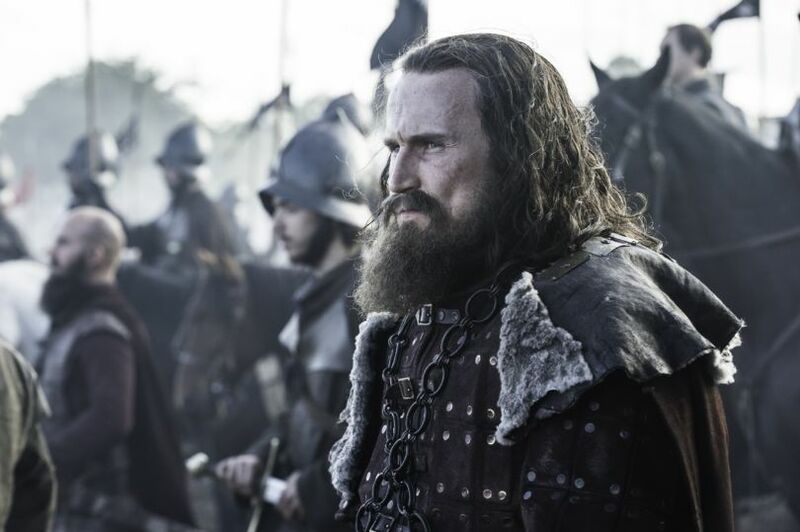 The episode featured battle scenes that rivaled Braveheart in scope and grit and action. And I think that as far as middle age combat goes, Braveheart is the standard bearer and thus, the closest parallel to “Battle of the Bastards.” But there were traces of Saving Private Ryan in there as well, as well as shades of Lord of the Rings. This also speaks to just how big the show can go at times, as it can easily be compared to massively huge big budget movies without hesitation. Plus Ramsey finally died. So it was a pretty good episode. Someone young wasn’t going to make it through the Battle of Winterfell, whether it was Jon, Sansa 2.0, Ramsey or Rickon. Of course, Wun Wun, the lovable giant could have been young as well. He had one of those faces where frankly, it was just hard to tell how old he was. You know, like Selena Gomez. Because come on, she could be 16 or she could be 25. Who knows! Before getting into the power rankings, which will be short this week. 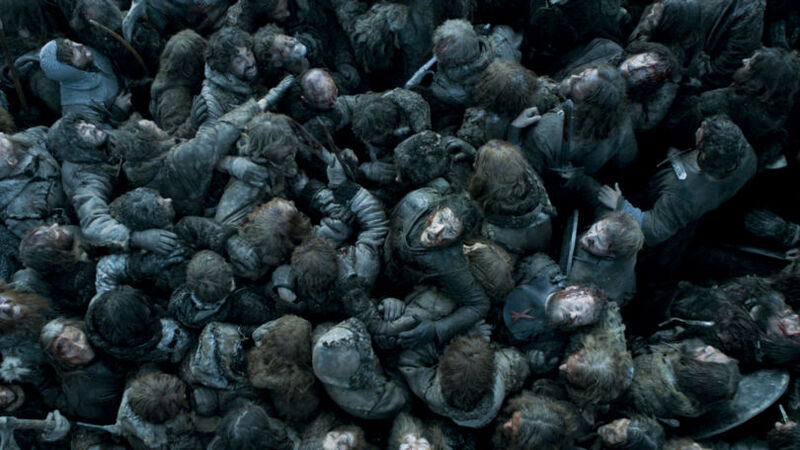 Let’s look at the winners and losers of the highly anticipated Battle of Winterfell. Mmmm…the lingering smell of death. No amount of laundry is going to get that stink out. Great sidekick or the greatest sidekick? Tough call. See, we told you Jon was important. Shut up, Lord of Light. No one likes an I told you so. See: Trump, Donald. I mean, he had a good night, regardless of what we’re talking about. No one stock piles favors better than Little Finger. Mmmm…Checkhov’s hounds. Like the gun, but better companions. Hey, his plan looked dope on paper. You at least went out in style. That should count for something. Dude, never run in a straight line. I mean, he had a good rough night, regardless of what we’re talking about. She lost that the minute she wrote to Little Finger for help. Or is Littlefinger? Either way. That won’t end well. See? Defeating the Boltons was like totes easy, brah. 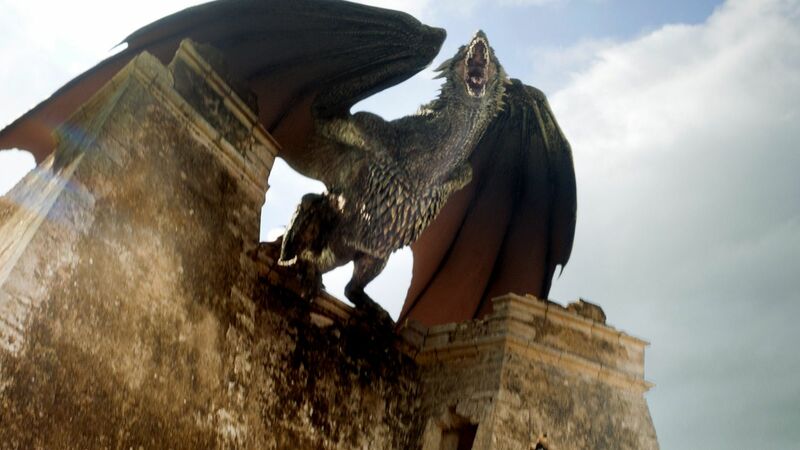 “The Battle of Bastards” only featured two of the 27 different story lines on Game of Thrones and the Battle of Winterfell is a no-brainer for the top spot, even though what went down over in Meereen was pretty sweet. But more on that in a few. Again, how is this television? We really are living in the future. Even in the past, Game of Thrones largely yadda-yadda’d their battles, again with Hardhomme being an exception. They went there with this one though and I for one wasn’t disappointed in the least. Yeah you could nitpick and call attention to two things: like Jon predictably doing something stupid and the last minute appearance of the Knights of the Vale, but that’s just that- nitpicking. 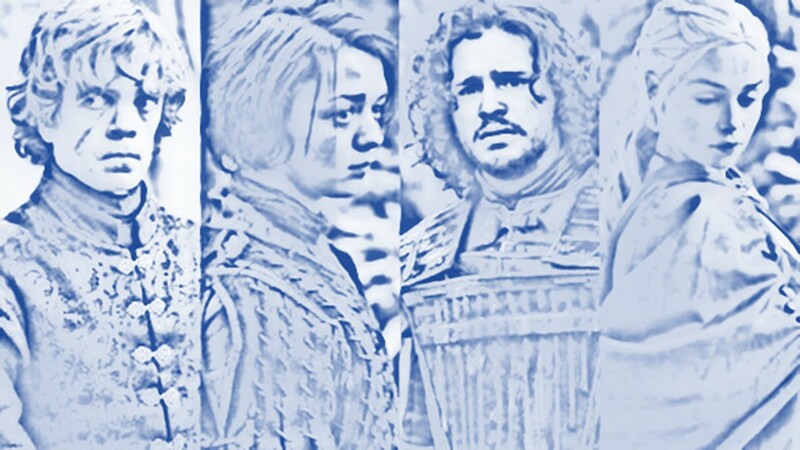 “The Battle of the Bastards” wasn’t perfect, but it was damn close and more importantly, close enough. Should we have been that surprised that Jon elected to play hero ball and despite their plan, rush out onto the battle field to save Rickon? No. Jon is a Stark and Stark’s don’t think things through. They’re like my daughter in that regard. Of course she wants to close doors because you know, stranger danger. But she doesn’t first think that she should make sure her fingers are cleared. The Starks really are the lovable toddlers of Westeros. They’re all emotion. In a different world Jon would have obviously listened to Sansa and heeded her advice. But instead he saw Rickon running and without hesitation, rushed out to save him. Then to make matters worst, he then charged the Bolton army solo. Who do you think you are, Jon Snow? LeBron circa 2009? You need a Kyrie to defy seemingly insurmountable odds. Don’t let the man bun fool you, Jon Snow still knows nothing. Lucky for Jon, he has Tormund who was a pure delight. Was I worried he would die? Hell yeah I was. Someone good had to die. That’s a rule. A bummer it was Wun Wun, though. Interesting that when the Wildlings attacked Castle Black in season 4, we feared a giant smashing through a door and now, we cheered for the same thing. Is that irony? Maybe. Either way, R.I.P. Wun Wun. You died like a boss. Speaking of death, while out on his pre-battle thinking stroll, Davos stumbled upon the dirty little secret about Shireen (psst, she was burned alive.) Just like Jon coming back to life, Davos finding out the truth about Shireen’s death and ruining the harmony between Jon, Melisandre and Davos sure seemed like an inevitably. Mainly because it’s Game of Thrones, a show generally averse to happiness and harmony. We just saw Ramsey get mauled by his hounds, that’s probably it for good feelings – so cherish them. They won’t last. Between Davos flipping out and Littlefinger confronting Sansa about some bills due for the Knights of the Vale’s assistance, things will be getting mighty uncomfortable up north soon. So yeah, back to normal! 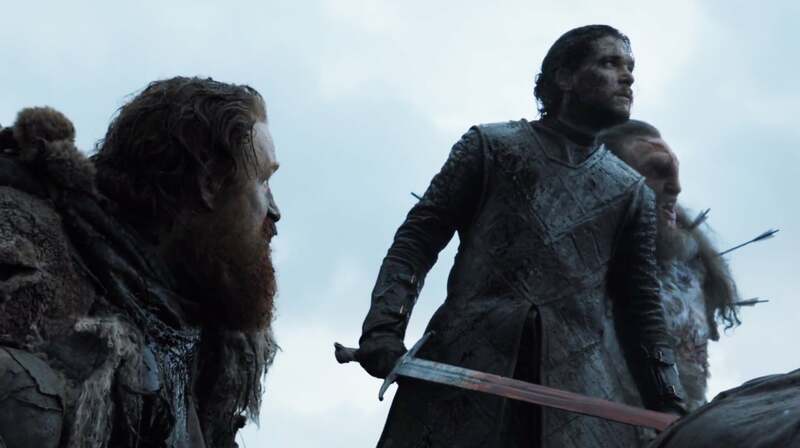 The alliance between Daenerys and the Greyjoys feels like an old-school wrestling alliance, even in so far as that those kind of wrestling alliances never worked out and always resulted in a big time back-stabbing. Dude, it’s the Greyjoys, Danys! You had to make them agree to not be ruthless assholes; something Yara initially balked at. Probably not a good sign. There are five things that we as a society have all agreed should never be trusted. On an unrelated note, I’ve always wanted to tell someone in a slightly threatening tone to “tell them what you saw here” like Tyrion did to the surviving master. I’m not sure if it’ll ever happen or what context or situation it might be, but that and kicking open a door are two things I’ve always wanted to do. A kid has to dream I guess.